Lauren Isabelle Neate ~ I am 23 years of age and am from the not-so-glorious town of Trowbridge in Wiltshire. 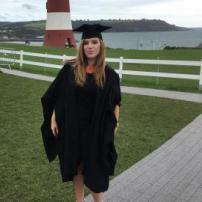 I have recently graduated from Plymouth University with a 2:1 Undergraduate Degree in History. I am aspiring to be a successful Journalist and I am using this platform to gain some experience. The ultimate goal is to be the next Louis Theroux. Email lauren_isabelle1994@msn.com for questions. Kevin Spacey Shocks with Sexual Harassment Statement.